Sometimes this happens. Sometimes change arrives unannounced. One moment, your life is a predictable place, and the next moment, everything is a wild carnival ride of flux. 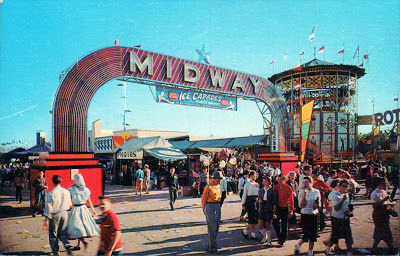 The midway is a sweet and melancholy place. You’re probably thinking that you’ll never come here, that your child will stay in the kiddie park, riding that adorable merry-go-round, forever. But you know that’s not true. Before we arrived at the midway, I had a knack. 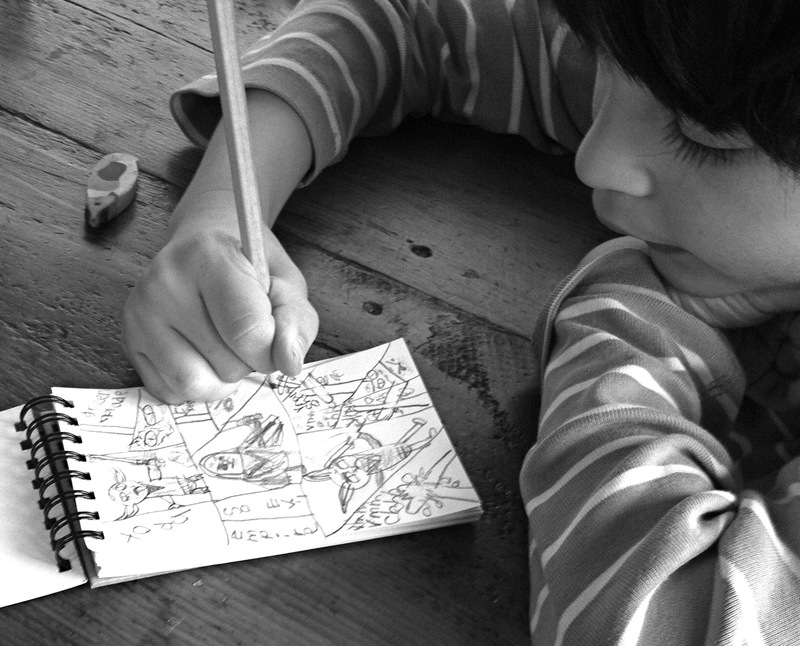 I knew how to outmanoeuvre night terrors and food aversions, how to arrange playdates and make time for homework, how to kiss the bruise at the moment the bruise happened. Most of all, I knew how to read his mind. Now what? He wasn’t the same son. What was he thinking? Was he experiencing existential emptiness, a yen for anarchism? 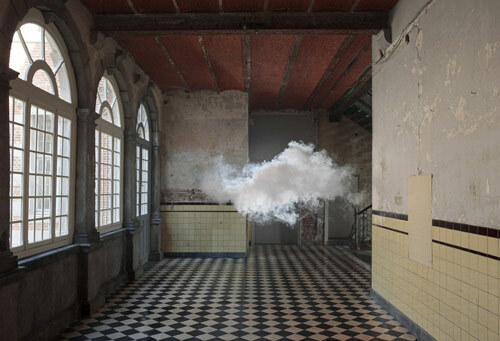 A sudden love of surrealist painting? What tools would serve me now? 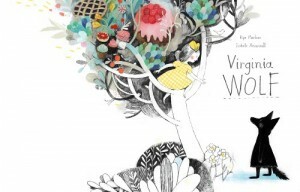 Congratulations to Isabelle Arsenault on winning the 2012 IBBY Canada Cleaver Picture Book Award for Virginia Wolf! For those days when you’re not above the weather or below it but seemingly more of it, when the clouds seem to have entered you, fogging your thoughts and misting over your heart, and you wish you lived somewhere less seasonally insistent, somewhere with uniformly blue skies. 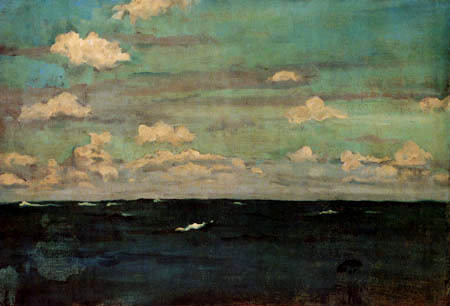 On days such as today, I like to think about clouds I have known and liked. 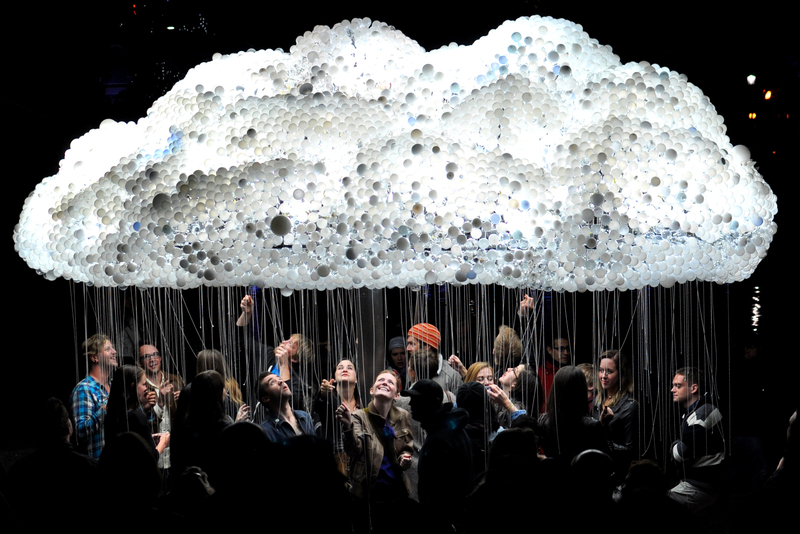 And then there is this cloud, which I adore for its incandescent people-gathering-powers. Calgary-based artists Caitlind r.c. Brown & Wayne Garrett constructed it out of 5,000+ Light Bulbs. And, finally, there are the books: Cloud Atlas (David Mitchell), Little Cloud (Eric Carle), Cloudsplitter (Russell Banks), The Theory of Clouds (Stéphane Audeguy), and The Cloudspotter’s Guide (Gavin Pretor-Pinney). And the songs: Clouds (Django Reinhardt), Clouds in My Coffee (Carly Simon), Above the Clouds (Paul Weller), and Mighty Clouds of Joy (Al Green). Because writing means making something (more or less) orderly out of something disorderly. And because writing takes me through tides and currents, as I sift dubious treasure. And because writing at some level involves the giving of form, voice, structure to what novelist Colm Toibin describes as “the stuff that won’t go away”… I have been thinking about flotsam and particularly two artists who have spent some time combing the world’s shorelines for debris. 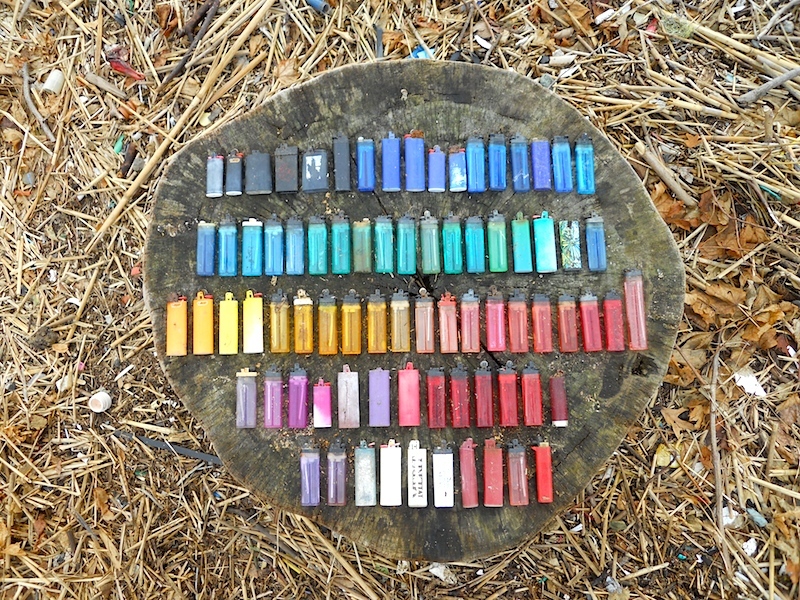 Brooklyn-based Willis Elkins has spent the past few years scouting trash (toothbrushes, syringes, dentures, Lego blocks, lighters) in an urban kayak. More recently he has been photographing objects pulled from New York City’s waterways in the wake of Hurricane Sandy. 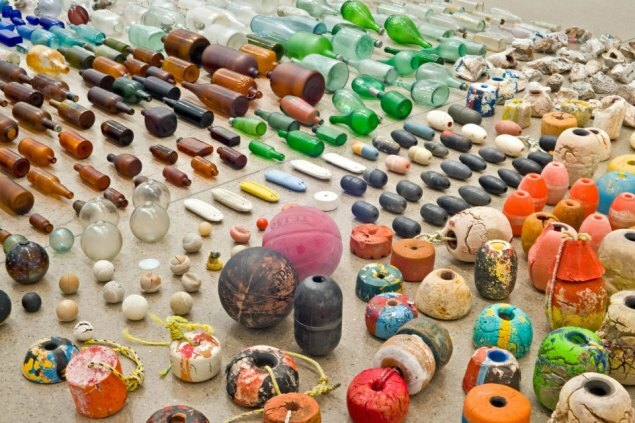 Mexican-born artist Gabriel Orozco collected thousands of objects from the shores of a natural reserve in Baja California Sur and a playing field in New York. He then assembled them into an installation that feels equal parts ecological critique and poetic taxonomy. I love how this work shows the controlling artist somehow managing the unruly world. It appeals to my sense of order, even if it’s pitifully cosmetic. It’s somehow reassuring to imagine our befouled world resurrected as art, to see a pretty halo placed on trash, to believe that art can arrange reality into a different picture. Then again maybe it can. 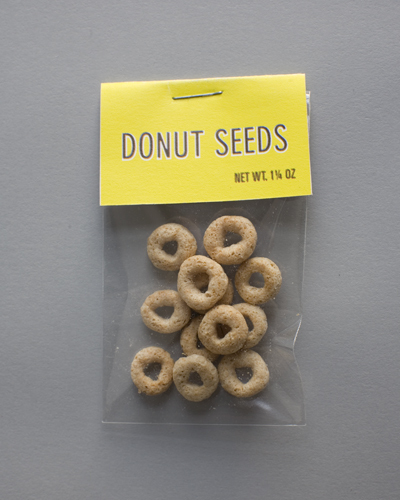 I am trying to be patient with my own seedling project. It is growing ever so slowly and some days seems so fragile, I think it could be destroyed by the slightest breeze. So I am hiding it from the world until it grows a bit more robust, and I’m enjoying this careful, watchful, private moment. When I visit schools I always tell the kids: “Don’t be discouraged by small starts. Every book I’ve ever done began with a tiny seed of an idea.” Now I am trying to remember this myself. Don’t be discouraged…. Water. Love. Quiet. Time. Patience. If I have made him sound routine and boring I apologize. Like his mother, he can be operatic in his fancies and moods. He has a vibrant imagination and can often be found sitting in his exact same chair drawing comics with his exact same pen or pencil. He can fill books and books this way and it is not unusual for me to open up an important (to me) writing notebook only to find it colonized by important (to him) robots and marshmallow men. 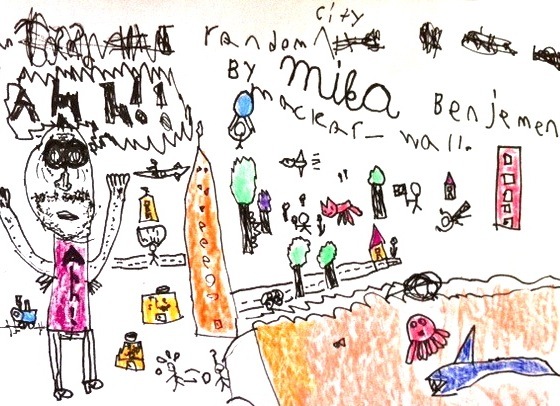 Here is his drawing of “Random City”, an apparently inhospitable place. Despite his wariness, he constantly surprises me. He may not spin toy rabbits on a turntable or throw hats out the window (as Martin and Mr. Flux do in the story) but his mind is constantly a-flux with new ideas and creations. He may appear outwardly conservative but inwardly he is an anarchic wizard—a living reminder to not judge a book etc. Twyla Tharp once noted: “Before you can think out of the box, you have to start with a box” and I know Mika and Martin would both agree. So there you are. I hope you’ll pick up a copy of Mr. Flux and share it with any Martins (or Mikas) you may know. Matte Stephens and I are both very proud of our collaboration.